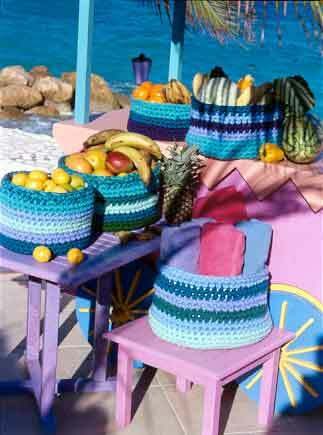 Fill these wonderful crocheted baskets with fall fruits or use them as decorative accents, selecting colors that match your decor. They are definitely Make It QuickTM patterns. You work with 6 strands of yarn and a large hook. 5 stitches and 5 1/2 rows to 4"/10 cm over pattern stitch using Size Q crochet hook. NOTE: Work with 6 strands of yarn held together throughout. Baskets can be lined with fabric if desired. 10 rounds C, 2 rounds B, 3 rounds A. 9 rounds B, 2 rounds d, 2 rounds E, 2 rounds H, 2 rounds A, 2 rounds of three strands A and 3 strands B held together. 12 rounds A, 2 rounds D, 2 rounds C, 2 rounds H, 2 rounds B. 13 rounds F, 2 rounds B, 2 rounds E, 2 rounds G, 2 rounds A, 2 rounds of 3 strands A and 3 strands G held together. 13 rounds E, 2 rounds H, 2 rounds G, 2 rounds D, 2 rounds B, 2 rounds H.
Chain 4. Join with slip stitch to first chain to form ring. Round 1. Work 2 single crochets in each chain-8 single crochets. NOTE: Do not join at end of round, simply continue with next round. Rounds 2 & 3. Work 2 single crochets in each single crochet - 32 single crochets. Round 4. Single crochet in each single crochet. Round 5. Increase 1 single crochet in every 8th stitch - 36 single crochets. Round 6. Repeat Round 4. Round 7. Increase 1 single crochet in every 4th stitch - 45 single crochets. Work 8 (12) rounds even. Fasten off. Work as for small basket through Round 7. Work 1 round even. Round 9. 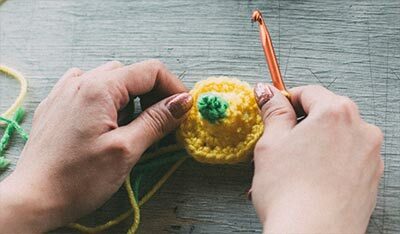 Increase 1 single crochet in every 9th stitch - 50 single crochet. Round 18. *Single crochet in next 8 single crochets, work 2 single crochets together; repeat from * around. Rounds 19 & 20. Work even. Fasten off. Work as for small basket through Round 9. Work 1 round even. Round 11. 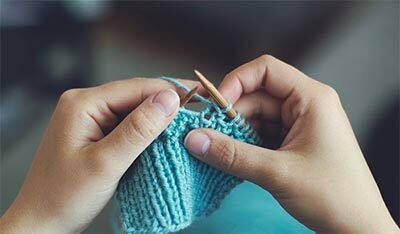 Increase 1 single crochet in every 10th stitch - 60 single crochets. Rounds 18. *Single crochet in next 13 single crochets, work 2 single crochets together; repeat from * around. Rounds 19-23. Work even. Fasten off.